Keeping and Breeding Firefinches in Portugal by João Boto. Want to know who you've been spying on via the AviCam? You've come to the right place. Here you will find a little about the species I care for as well as some info about the birds as individuals. The long promised photos are finally here - and more will be coming as time goes by. Most photos in this section of the site have been taken with my new Canon Digital Rebel (300D). It takes very nice pictures, but those shown here have been reduced in size and compressed to allow for smaller file sizes. I also have to deal with less than ideal lighting conditions in the aviary. Still, the results are pretty good. While I do not keep firefinches at this time, I am planning to invest in a few pair if/when I can find them available. If you are interested in learning more about this lovely finch, please check out the article by João Boto of Portugal. It is an excellent read. If you have questions or comments for the author, feel free to send them to me and I will forward them on. Continue to the next page to read about the Societies. TOP ROW - Masked grass (on sundeck), Owl, Society, Zebra, Owl, Blue Cap Female, Strawberry Female, Blue Cap Male. BOTTOM ROW - Zebra (normal gray), Society, Society, Strawberry Male. 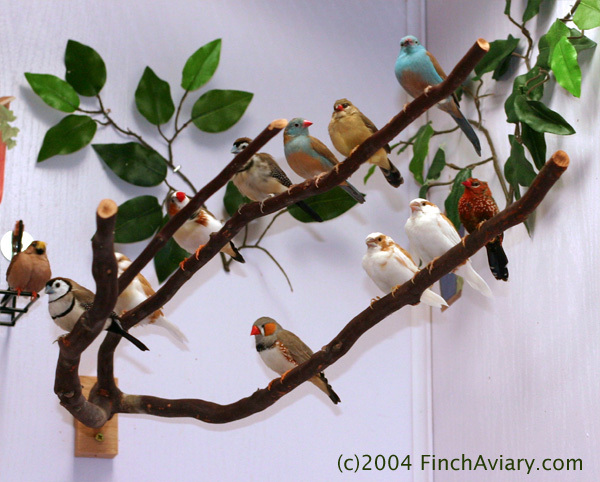 We maintain a non-breeding aviary and have no birds for sale. Our site is for informational and entertainment value only.